..and get FREE developer rights so you can charge your customers when you install it on their website!! Re-Engager Pro: With powerful extrea features like the 'custom inbox' that lets you delive inbox messages with text, links, optin forms, Facebook connect and more right inside of Re-Engager on your website! FREE Developers Rights: With developers rights to Re-Engage you can install it on your customers websites and charge them anything you like for this service! Don't miss out, click below to upgrade. In deciding to invest in the Re-Engager software. Now as a special we are going to give you the opportunity to the next level with the upgraded Re-Engager PRO version! The auto redirect functionality, which allows you to auto redirect people to any URL you like (even your affiliate URL) automatically after Re-Engager forces them to return to your site! 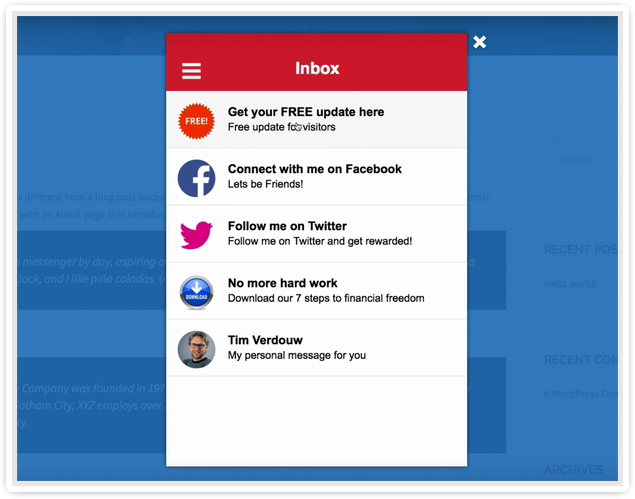 The high engaging 'InBox' functionality which allows you to display a fully functional and customizeable Facebook style Instant Messenger 'InBox' right on your website. developer rights to the Re-Engager plugin. With this developer rights upgrade you can install Re-Engager on other peoples websites and charge them a fee for this service. You can also flip or sell sites that have the Re-Engager plugin on it! Re-Engager is a POWERFUL software that is going to get you more clicks, leads, and sales, and you made a WISE decision when you decided to invest in it. However now its time to UPGRADE and get the amazing PRO features. The Automatic Redirect, The Facebook style Instant Messanger 'InBox' functionality, and of course our fast action bonus Unlimited Developer License .. when you upgrade right now!